Armenian Foreign Minister Zohrab Mnatsakanyan, who is in Paris on a working visit, on Tuesday met with French Minister for Europe and Foreign Affairs, Jean-Yves Le Drian. 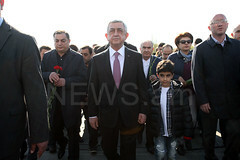 The FM of Armenia noted that it is very emotional to be in Paris on this very day, and he expressed Armenia’s solidarity with France and the French people after the fire at the Notre Dame Cathedral in Paris. Minister Mnatsakanyan also handed to his French colleague the letter addressed to French President Emmanuel Macron from Armenian Prime Minister Nikol Pashinyan, and with which the latter expressed the hope that necessary steps will be taken by joint efforts to restore the former appearance of this cathedral. Mnatsakanyan and Le Drian expressed satisfaction with Armenian-French cooperation, and stressed the readiness of the two sides to ensure the continuity of bilateral relations. The Armenian community in France and its bridging role in the further strengthening of relations between the two countries were particularly highlighted. 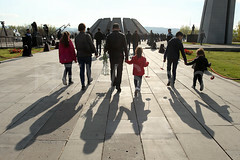 Minister Mnatsakanyan underscored that the Armenian side lauds President Macron’s order on proclaiming April 24 as the national day of Armenian Genocide commemoration in France. Reflecting on the Comprehensive and Enhanced Partnership Agreement which Armenia and the European Union have signed last year, the Armenian FM reaffirmed the Armenian government’s commitment and political will to ensure the effective implementation of this document. Zohrab Mnatsakanyan also underscored the matter of launching the visa liberalization dialogue. And touching upon the Nagorno-Karabakh (Artsakh) conflict, Armenian FM presented to his French counterpart the details of his recent meeting in Moscow, and reaffirmed Armenia’s principled stance and approaches toward achieving solely a pacific resolution to this conflict. Both sides attached importance to the formation of a favorable climate for promoting a peaceful settlement.